In past seasons of the NASCAR Canadian Tire Series, efforts of D.J. Kennington and Scott Steckly have been a dominate duel that has made Canada's most popular stock car racing a rather predictable sport. 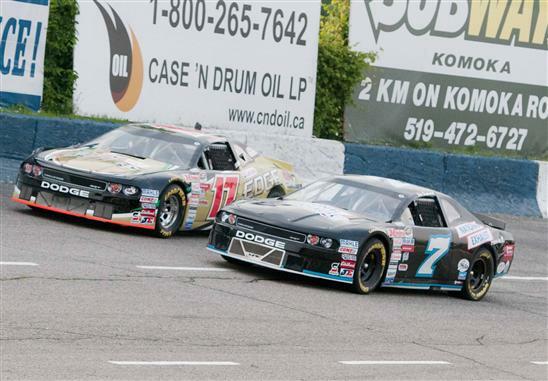 The premiere of the 2013 NASCAR Canadian Tire Series on the Canadian Tire Motorsport Park road course brought an optimistic belief that a new season will foster more parity throughout the race grid. 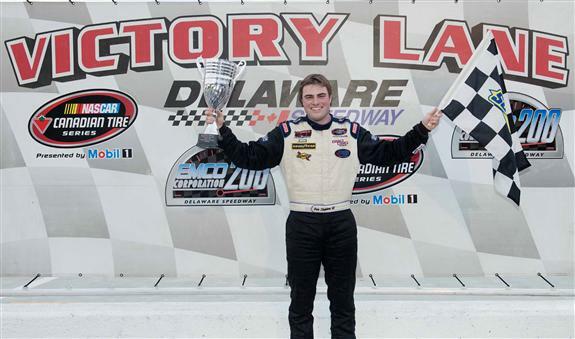 With the opening race serving as a stage L.P. (Louis-Philippe) Dumoulin's first series win, would the short half-mile oval of Delaware Speedway produce another new face in victory lane? After a dismal start to his 2013 campaign with a DNF at Canadian Tire Motorsport Park, Scott Steckly returned to the form of a two-time NASCAR Canadian Tire Series champion by taking pole for the EMCO 200. The #22 Dodge of Steckly was joined on the front row by D.J. Kennington's #17 Dodge Challenger. Steven Matthews, Pete Shepherd III and J.R. Fitzpatrick rounded out the top-five qualifiers for the 200-lap Saturday early evening feature. Right off the bat, Scott Steckly was a man on a mission at Delaware Speedway. From the pole position, Steckly's #22 car led the initial 70 laps of the EMCO 200. With the seasoned driver hunting for a first win in 2013, the winner of the NASCAR Canadian Tire season opener found problems after a handful of laps. L.P. Dumoulin pitted to the attention of his crew on lap 8 requiring an extended stay. Dumoulin would return to the race in his #47 Dodge but finished 40 laps down. Along with the Canadian Tire Motorsport Park race winner, that race's runner-up also found misfortune at Delaware Speedway. Fighting near the front easily, Jeff Lapcevich suffered a flat tire on lap 58 losing three laps he'll never recover. The EMCO 200's first caution came out on lap 18 with a multi-car wreck involving Ryley Seibert's #09 car, the #28 of Dave Connelly and the #69 of Trevor Seibert. Overall, six caution periods lasting 46 laps accompanied the running of the 200-lap race. However, despite the several cautions, only two cars in the field of 22 competitors would be classified as out of the race. After a positive start, the EMCO 200 quickly took a turned badly for Scott Steckly. Less than halfway distance into the race, reports of smoke from the #22 Dodge was a prelude to a lengthy time spent behind the wall. Forced off the race track on lap 93 for repairs, Steckly would return on lap 162. Finishing 71 laps behind, the favoured championship contender starts his 2013 NASCAR Canadian Tire Series effort with two poor race results. With Scott Steckly out of contention at Delaware Speedway, the fight at the front was maintained between D.J. Kennington, J.R. Fitzpatrick, Steven Matthews and Pete Shepherd III. On lap 150, the EMCO 200 was climatically decided with a drag race between Shepherd and Fitzpatrick. Prevailing in the fight was the #7 Dodge driven by Shepherd will preceded to lead the remaining 50 laps to win by 0.373 seconds over the #84 Chevrolet of Fitzpatrick. Pete Shepherd III fourth career NASCAR Canadian Tire Series victory, the win is the 26-year old's first since 2011. Placing in the runner-up spot, J.R. Fitzpatrick fought with the only Chevrolet at the EMCO 200 field. Enjoying one of his strongest race efforts in his NASCAR Canadian Tire Series career, Steven Matthews started and finished third in his #15 Ford. The 23-old year Matthews wound up beating fellow top-five finishers D.J. Kennington and Martin Roy to the line.